This post will show a couple of other uses for an Aquarium Sponge Filter. (1)The use of an aquarium sponge filter connected to either a non stop air pump or to an automatic battery air pump is a simple way to insure your fish survive a power failure longer than 4 hours. The picture to the left shows a Hydro sponge #1 connected to an automatic Million Air 'D' cell battery pump. 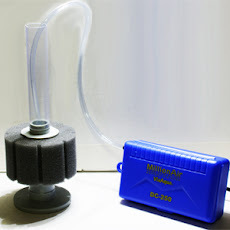 With this method the pump turns 'ON' when power is cut, thus running this filter, however with this method, best results are achieved by having a second sponge filter already running in the aquarium (so as to be "seeded" biologically) that can be reconnected to the battery pump. If one uses a non stop air pump, the air pump runs continuously on either AC or its rechargeable battery. The downside here is the air pump costs considerably more. (2) Another unique idea is to run a UV Sterilizer with your sponge filter being used as a pre-filter for more UV Sterilizer efficiency (make sure that your UV Sterilizer has its UV Bulb/ Lamp changed every six months for peak efficiency as well). The use of a UV Sterilizer can aid in the prevention of many diseases (especially water borne bacteria), as well as improving Redox for general fish health.